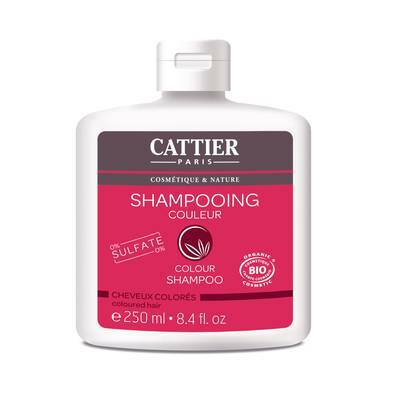 The Cattier sulfate-free Colour Shampoo gently cleanses and nourishes hair while preserving the long-lasting glossy colour. Its rice extract active ingredient, rich in amino acids and peptides, protects, repairs and strengthens the hair fiber to revive the colour, giving a silky feel. Colour remains intense and radiant, hair is soft and shiny. Aqua, Sodium Cocoamphoacetate, Decyl Glucoside, Glycerin, Citric Acid, CyperusEsculentusRootOil*, SimmondsiaChinensisSeedOil*, AloeBarbadensisLeafExtract*, OryzaSativaSeedProtein, OryzaSativaExtract, Phytic Acid, Gluconolactone, Calcium Gluconate, IsoamylLaurate, PCA GlycerylOleate, XanthanGum, BenzylAlcohol, Sodium Benzoate, Parfum, Limonene, Linalool.